I have been eating a lot of sandwiches, toasts and salads lately. All lovely things, but also things that involve just a toaster and maybe a skillet and moderate "warmth" to the meal when served. So in contrast, I have been craving one-dish, baked meals, aka comfort food. Pasta bakes, lasagna, pot pie, enchiladas and more. All recipes that are super warming, comforting, leftovers-approved and a complete meal in one dish. Fuss free. 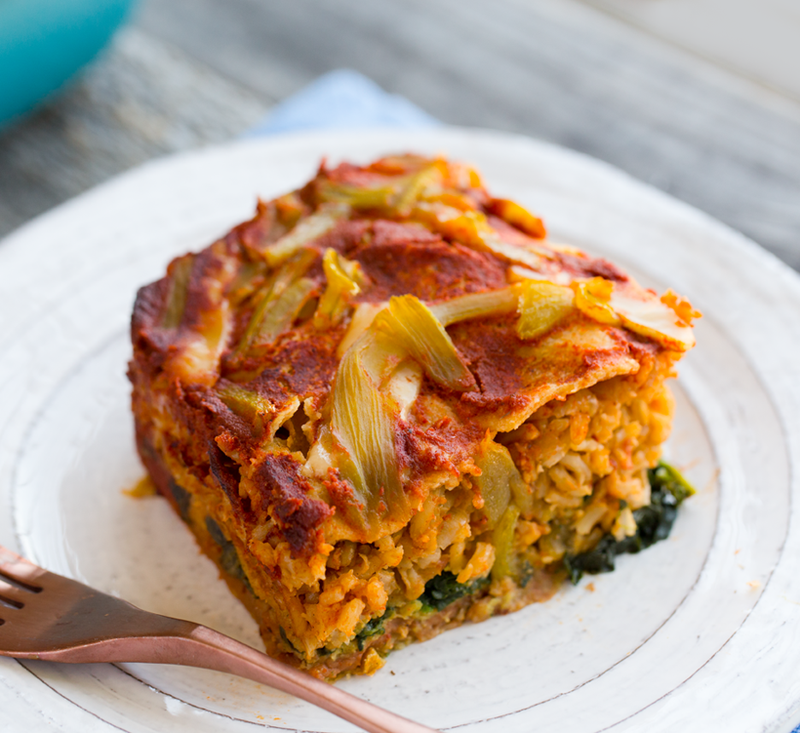 So today I whipped up this Easy Vegan Enchilada Casserole with beans, hatch chiles, red rice, layers of fluffy baked corn tortillas, a hint of vegan cheese and loads of spinach too. Guacamole and cashew cream on top would be the perfect side accent. And my favorite thing about this recipe is that you can bake this dish in the morning or afternoon and stick it in the fridge until you need it to quickly serve at the end of a long day! Or you can even prep it the night before and have it ready for lunch or dinner the next day. Hope you love this simple and nourishing meal!.. I love the classic vegetarian combo of rice and beans. Add in some veggies, tortillas, salsa or sauce and some accents like avocado or vegan sour cream and you have some very wonderful meal opportunities. 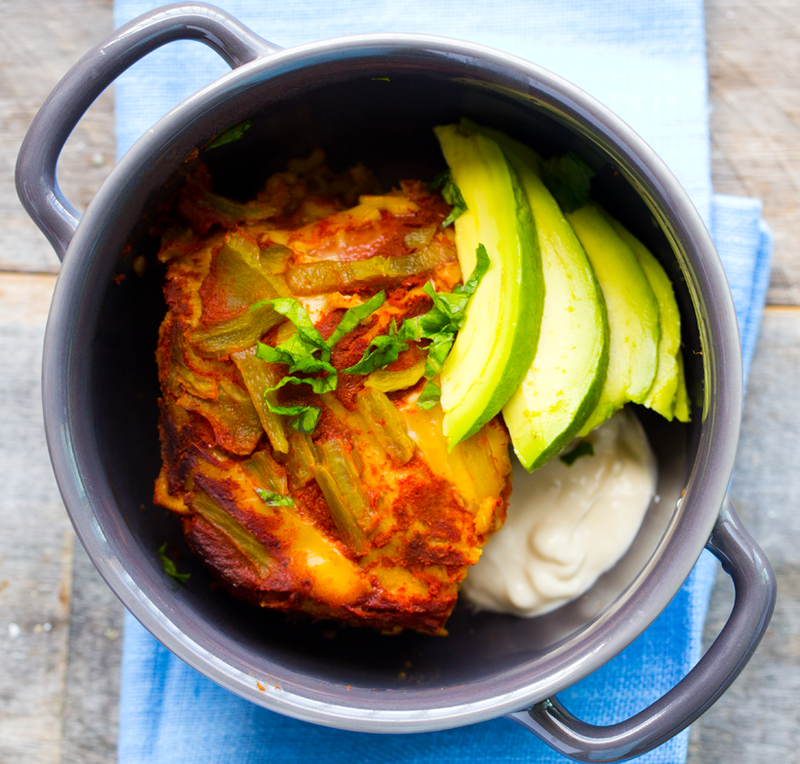 Basic burritos, tacos or burrito bowls are good solutions to dinnertime meals, but for ultimate coziness, try a baked dish. 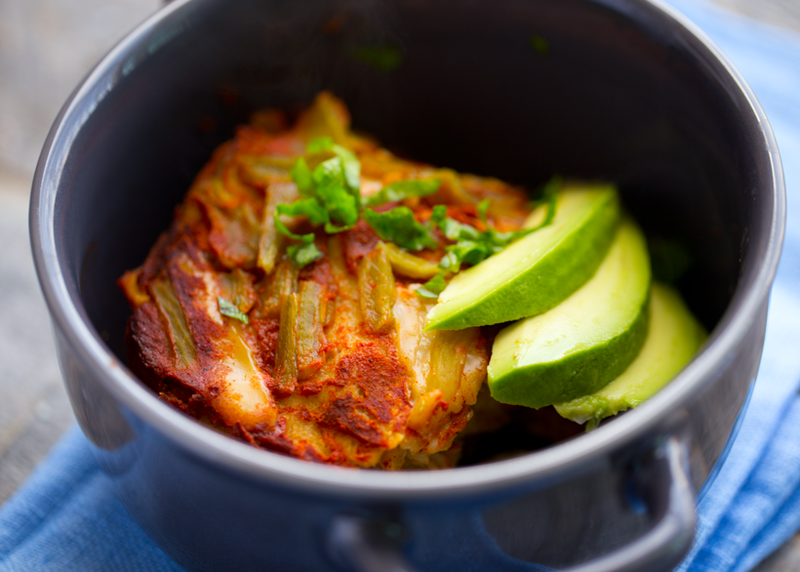 Enchiladas are awesome, but today I switched things up with a super easy enchilada casserole. You just layer the ingredients, bake and serve. Other Fillings? You can change up the rice and beans if you'd like. Skillet veggies like mushrooms or zucchini or even kale would be nice too. 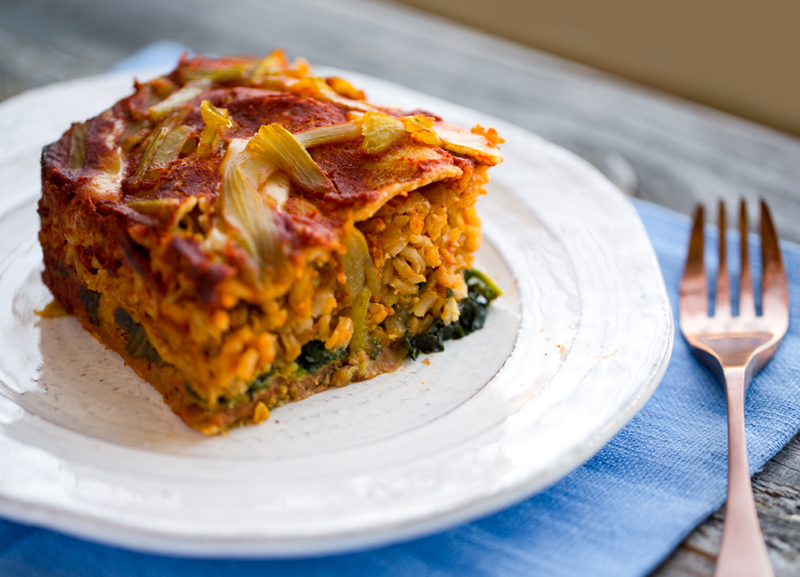 You could make this an all-veggie casserole! Or you can try lentils or butternut squash or loads of vegan cheese (shredded or cashew) or sweet potato or cooked potatoes. So many options! The basic idea is that you are layering ingredients in between the tortillas, smothering everything in sauce and baking to cook and tenderize everything together. Boom. Enchilada casserole. How you layer the tortillas in a small-ish square baking dish..
Hatch chiles on top are a must-have for any Mexican casserole. The cheese is optional. I added only a very small amount of vegan cheese on top. 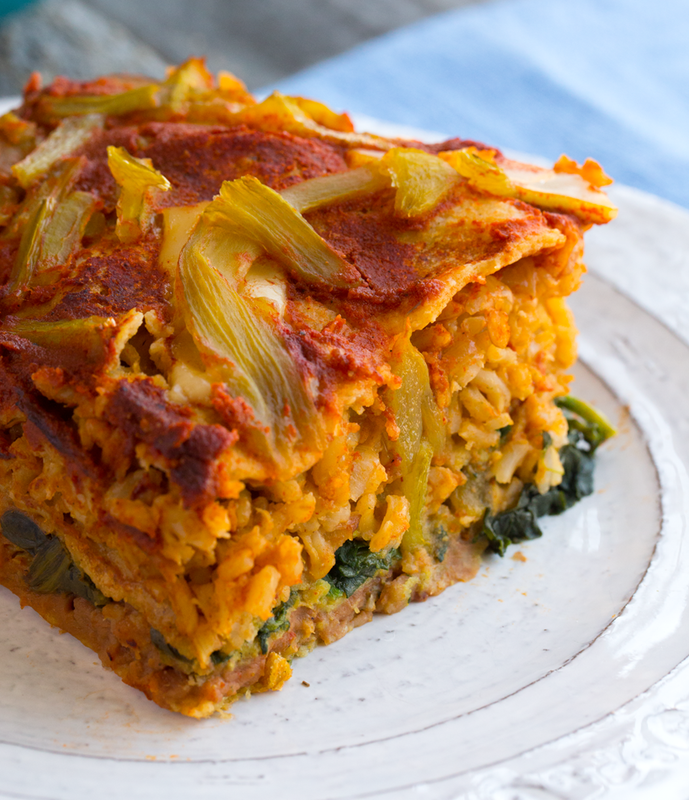 This recipe makes four hearty servings, using a square eight inch baking dish. You can increase the amounts of everything if you need to fill a larger casserole dish. Life! Oh my this week has been a whirlwind. But a beautiful one because of happy things and a whole lot of gorgeous weather. I have been working really hard lately on a bunch of side projects so it was really nice to get away for a few hours to attend a friend's child's birthday party on Saturday. I didn't stay long, but it was just enough time to soak up some friends on a beautiful sandy beach, laugh, smile and feel connected - even if for a small slice of my day. I am so thankful for opportunities to connect with people one-on-one in non-work settings. I feel like I want a whole lot more of that. After the party I came home and did an awesome run-sesh in the gym, music blaring in my headphones, and lounged by the pool a bit. The weather was perfection. But somehow I managed to sprain my ankle during that run, so today, Sunday, I have been doing a whole lot of work-from-home stuff in between icing and raising my ankle. I hope it heals soon! I haven't had a sprain or any injury in so long, so if you have any tips, let me know! It feels a little better today, though it was really swollen this morning. Anyways... that's the life update. Hope you had a content weekend as well! This coming week I have some projects I am posting here on the blog and I am filming my second matcha chat video!! Let me know if you have any matcha questions -- or any questions about ANYTHING - you would like to chat about. 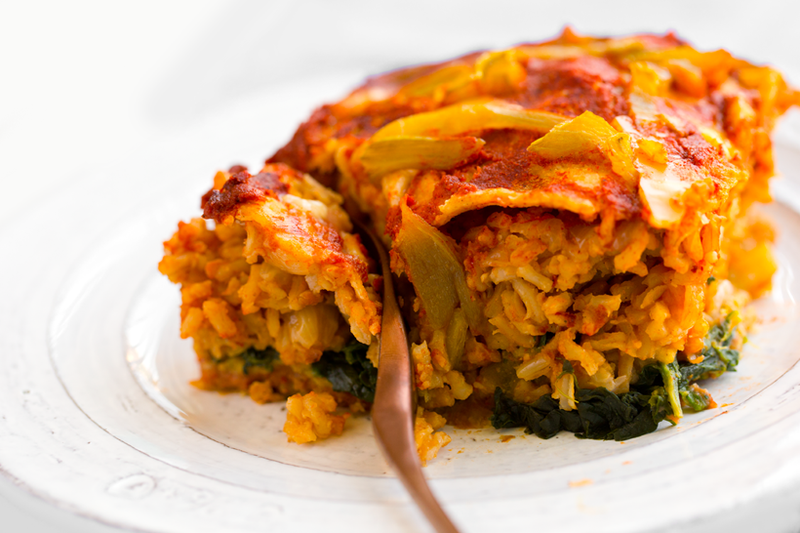 This easy enchilada casserole is a complete meal and can be whipped up in just under an hour - maybe shorter if you have the rice prepped! Rice: For ease, you could use a boxed spanish rice or make you own very easily as well. For DIY rice, follow this recipe. Whip up your easy enchilada sauce. Recipe here. Or you could use store bought. 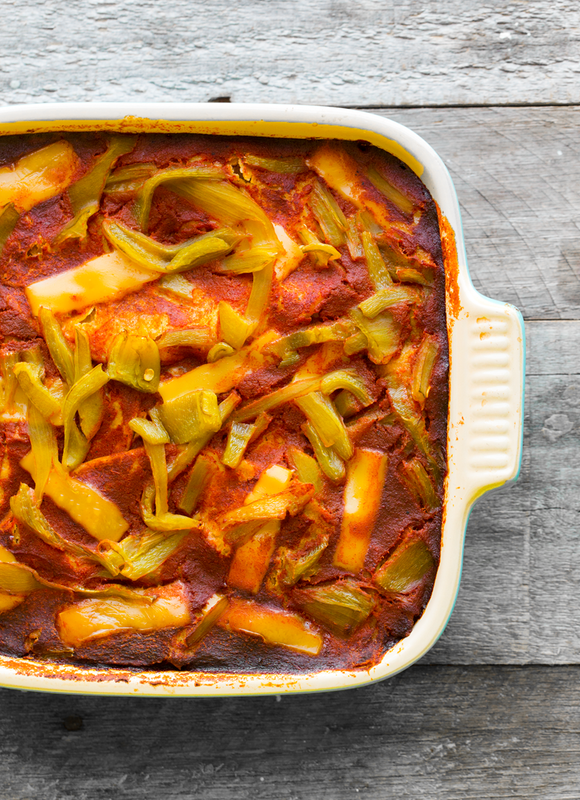 Start layering your casserole. 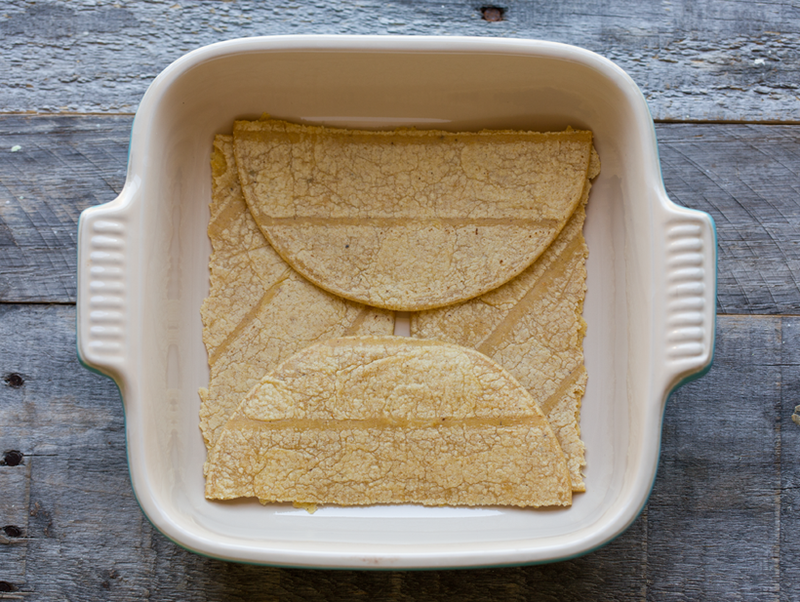 Tear the corn tortillas in half, and layer them so that the long edge goes along the edge of the dish. Add four halves to each layer, as shown in a photo in this post. Then add your beans, smooth them out. Top the beans with a layer of tortillas (4 halves a gain). Next add the spinach and another layer of tortillas. finally, add a layer of rice, another layer of tortillas, the red enchilada sauce, optional cheese and the hatch chiles on top. Cover with foil and bake at 400 degrees for 20-25 minutes. Remove foil for the last 2-3 minutes of baking. 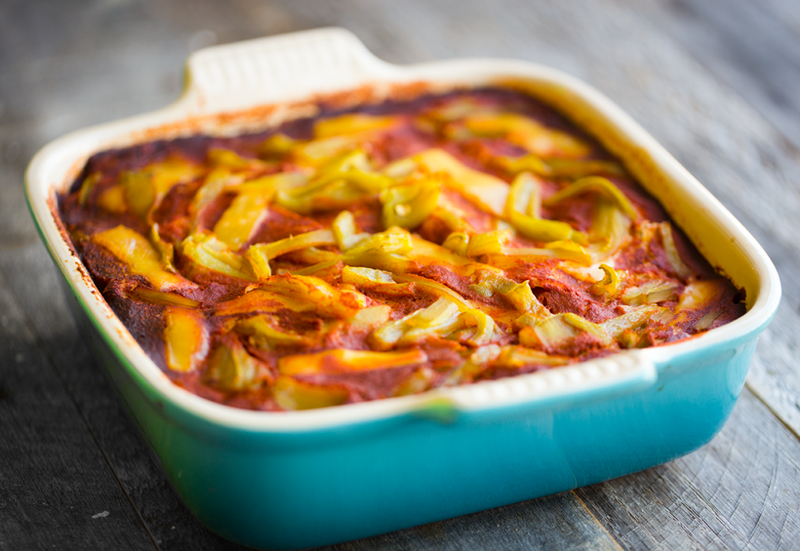 Allow the casserole to cool at least 15 minutes before scooping and serving. Serve with optional cashew sour cream and guacamole or avocado on the side.